Coming Soon! Opening in Late May 2019. Santa Rosa Medical Center wants to make sure you have convenient access to emergency care, regardless of where you are. That’s why we have expanded our emergency services to Pace. As one of the fastest growing communities in Northwest Florida, Pace ER provides access to needed services for our local residents and visitors. Pace ER cares for patients 24-hours a day and includes features such as on-site imaging and lab services, board-certified physicians and an experienced emergency services clinical support team. Onsite laboratory with comprehensive testing: When choosing a free-standing emergency room, know what they offer. The Pace ER includes full onsite lab testing. While others might offer merely basic bedside testing (point-of-care testing) and outsource more complex lab tests, Santa Rosa Medical Center realizes the importance of providing fast and accurate laboratory results in an emergency. Onsite imaging: Pace ER has CT, ultrasound and x-ray to provide immediate radiology testing and results. 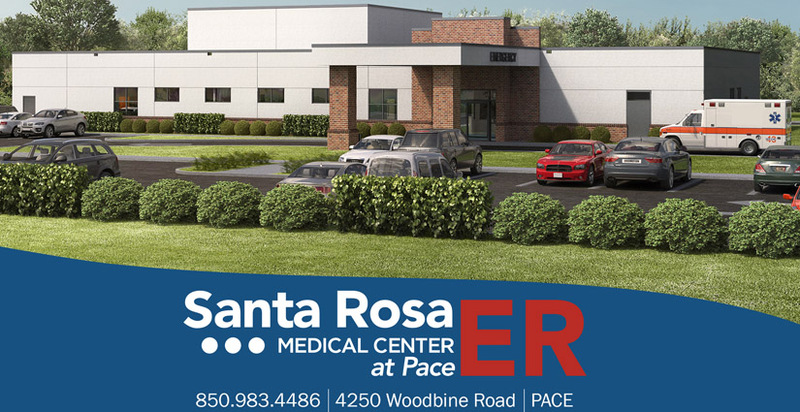 Over 11,000 square feet: Pace ER was built from the ground up with the goal of supporting future growth of Santa Rosa County. Pace ER is conveniently located at the corner of Highway 90 and Woodbine Road in Pace. Q: What is a freestanding emergency department (ED)? A: Pace ER is an emergency room just like any ER in a hospital -- except it is not attached to a hospital. The staff will be available to treat patients 24 hours a day, seven days a week for emergency and urgent medical conditions. Pace ER will have board-certified emergency room physicians and registered nurses along with the same diagnostic equipment found in most emergency rooms. Pace ER is a department of Santa Rosa Medical Center. It offers emergency care, but has no inpatient (overnight) beds. Q: What does it mean to me? A: The new freestanding ED provides a convenient, comfortable and welcoming atmosphere. The staff is dedicated to offering quality emergency care as efficiently and quickly as possible. Q: Is Pace ER like an urgent care center? A: Pace ER can treat more serious conditions than an urgent care. Unlike most urgent cares, Pace ER provides full emergency services 24/7 and treats patients by walk-in or by ambulance. Q: What conditions can a freestanding emergency center treat? A: Pace ER is prepared to treat a wide variety of serious illnesses and injuries, including severe chest pain, severe allergic reaction, severe respiratory distress, broken bones, cuts requiring stitches, concussions and other conditions. Q: What insurance plans does Pace ER accept? A: Since Pace ER is a department of Santa Rosa Medical Center, it accepts the same insurances, including Medicare, Medicaid and most insurance plans. Q: What if I have to be admitted to a hospital? A: In cases where patients come to Pace ER with conditions that require hospital treatment, we will be prepared to begin important initial treatment and stabilization and then will transfer them to a hospital. Q: Am I required to pay for services prior to being treated? A: Consistent with Santa Rosa Medical Centerr’s mission and the requirements of the Emergency Medical Treatment and Active Labor Act (“EMTALA”), Pace ER will treat all emergency room patients regardless of their ability to pay, including a medical screening examination and appropriate stabilizing treatment as required by EMTALA. If you are experiencing a life-threatening emergency, please call 911 or go to the nearest emergency department. Come to our open house! Learn more here.